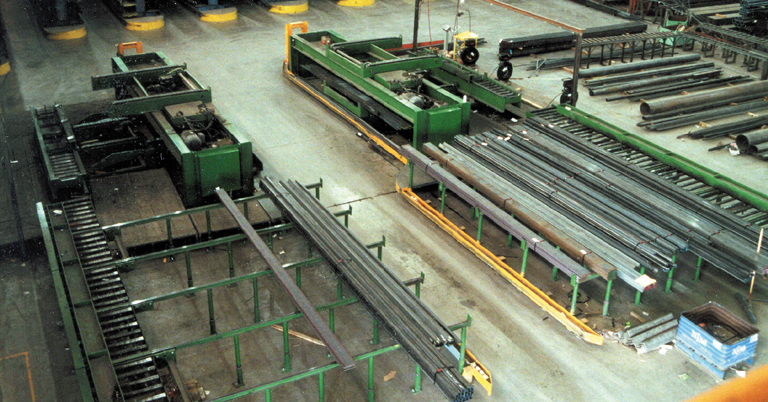 Schiller Park, IL - Braner/Loopco announces the availability of a newly developed Long Products Bundling System, an automated materials handling system that reduces the time metal distributors spend filling individual orders for long products (pipe, tubing, round and rectangular bar, and structural shapes) by as much as 75%. The new Braner/Loopco Bundling System mechanizes and automates the handling of heavy long product storage trays, and automates the bundling, strapping, weighing, wrapping, and final staging of the finished package. In addition, the new Bundling System improves side loader material handling efficiency by reducing time lost waiting to transport storage trays to and from storage racks. Using a Braner/Loopco Long Products Bundling System, one attendant can fill between 80 to 120 orders per shift, more than three times the orders that one attendant can fill utilizing other methods. The new Braner/Loopco Long Products Bundling System reduces the time and energy required to fill orders via a system of equipment designed to handle heavy storage trays and automating the bundling, banding, weighing, and final staging of the order package. The order filling process begins with the side loader retrieving several product trays from the stack rack and loading the trays onto the Bundler "receiving station". The full trays are advanced to the bundling station where each tray is hydraulically positioned for unloading. Utilizing a set of powered "stripper" arms, the attendant is easily able to remove from the tray the number of pieces necessary to fill the order. The stripper arms then replace the remaining product back into the tray, and the emptied tray is shuttled to the "return station" where it is positioned for removal by the side loader for return to the stack rack. Metal distributors typically segregate and store long products inventory in formed sheet metal trays, with each tray containing up to 10,000 pounds of a specific product (i.e. tubing, bars, angles, etc.). These trays are typically stored in vertical stack rack pockets that allow for easy placement and retrieval of the trays via side loader fork truck. Long product orders are normally filled by retrieving a tray of a specific product from the stack rack and transporting that tray to an order filling area where an attendant, often using several sawhorses, physically removes from the tray the quantity of product necessary to fill the order. The emptied tray is then returned to its stack rack pocket while the order filler forms the product into a bundle, then bands and wraps the bundle. After the bundle is bundled, it is transported to a scale where it is weighed and tagged, and finally transported to a storage area to await shipment. The typical long products order filling process is slow, usually taking 15 minutes or more to fill each order, and physically demanding and a source of worker's comp claims. The pieces that comprise the order are collected in the "bundling station" where they are quickly banded together, weighed, tagged, and if necessary, plastic wrapped. After the bundle is complete, it is conveyed away from the Bundler to a runout table where it is power discharged onto a storage table where it is stored awaiting shipment. Braner/Loopco Long Products Bundling Systems are designed to handle up to 25' random lengths stored in trays containing up to 10,000# of product. Custom Bundler designs are available to suit specific applications. Additional information can be obtained by contacting Braner/Loopco. Please check the Braner/Loopco web site at www.braner.com for information on high-quality Braner/Loopco equipment and systems designed to improve product quality and operating efficiency in the metal distribution, coil processing, and tube & pipe industry.